The People's Republic of Bangladesh is developing country in South Asia that is home to approximately 160 million people. In November 2016, the nation joined a number of other developing countries most vulnerable to climate change in signing on to the Marrakesh Communiqué at COP22, which among other things, pledges signatories to lead in "greening our economies as our contribution towards achieving net carbon neutrality and 100% renewable energy." There is no target date for the 100% renewable energy goal to be achieved, and the country has a long way to go to achieve this aim. Prior to the climate talks at COP22, the national renewable energy goals centered around a target of meeting 5% of the country's approximately 9000 MW (and growing) renewable electricity demand with renewable sources by 2015 and 10% by 2020. As of the end of 2016, however, according to the Bangladesh Power Development Board (BPDB), nearly all grid connected power in Bangladesh was still being generated by fossil fuels, with 64% of that being natural gas. The only statistically registered grid-tied renewable electricity being generated was hydropower, which accounted for less than 2% of generation. All but about 600 MW of capacity were in-country. That said, several small (<1 MW) and a few larger (3-30 MW) grid connected solar power projects were completed or in development by the end of 2016, according to BPBD. BPDB also installed four grid connected wind projects totaling 900 KW at the Muhuri Dam area of Sonagazi in Feni and another 1000 KW (50 turbines of 20 kW capacity each) wind battery hybrid power Plant at Kutubdia Island. A 15 MW wind power plant is also being developed on the coast, and there is hope that better resource mapping will spur confidence in investors to pursue other projects. 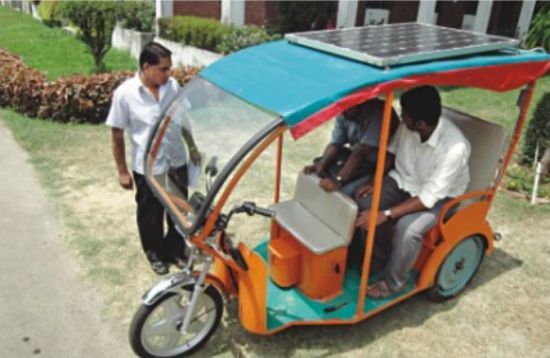 It is in off-grid, rural renewable energy development that the country has made some of the most significant progress. As part of the effort to make this energy transition, the country has been focused on rapidly expanding first time access to electricity among its citizens with decentralized renewable energy. The primary technology type being implemented is solar home systems backed up by batteries, which the government aims to have installed for nearly a third of all households by 2017. As is the case for many communities in developing countries, grid access is extremely limited in much of Bangladesh, and renewable energy has been a cost effective, pragmatic solution for providing electricity to these areas. In 2002, only 30% of the 162 million people of Bangladesh had access to electricity, greatly impairing quality of life and economic development. 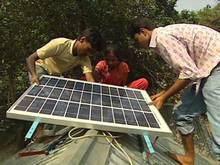 In response, Bangladesh government's Infrastructure Development Company Limited (IDCOL) initiated the solar home system project to expand electricity access to citizens using solar photovoltaics and backup batteries. The International Development Agency (IDA), the soft loan arm of the World Bank, helped finance the project, which in just seven years, raised the percentage of people with electricity to 40%--all with decentralized renewable energy. The project brought renewable power to more than 600,000 people who had never before had electricity. As of 2016, the Bangladesh is reported to have achieved 60-74% electrification. The technology mix, as of 2014, included 320,000 new solar homes (far surpassing the original target of 50,000) and a 250 kw biomass plant that uses rice husk as its feedstock and produces electricity for 300 homes and shops. The project was implemented by the Rural Electrification Board through its rural electric cooperatives, in partnership with NGOs and private sector companies. The benefits were many for those with this new electricity. Children's study time is reported to have increased by approximately 6%, children's sick days from school dropped 20%, home businesses rose 8%, household chore times decreased by 6%, and distribution network losses went down about 6%. The total cost of the program was US$290 million. 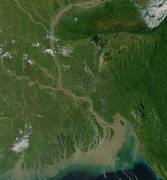 In addition to IDA, financing was provided by the Global Environment Fund (GEF), the Government of Bangladesh, and local communities. The financing structure consisted of micro-credit loans and up to 80% refinancing for participating organizations through the central IDCOL. The project's success attracted other financial support partners to come on board, including the Asian Development Bank, KfW and GTZ (German development bank and German international cooperation enterprise). The Inter-American Development Bank, the Japan Bank for International Cooperation and the Global Partnership on Output-Based Aid have also shown interest in participating. 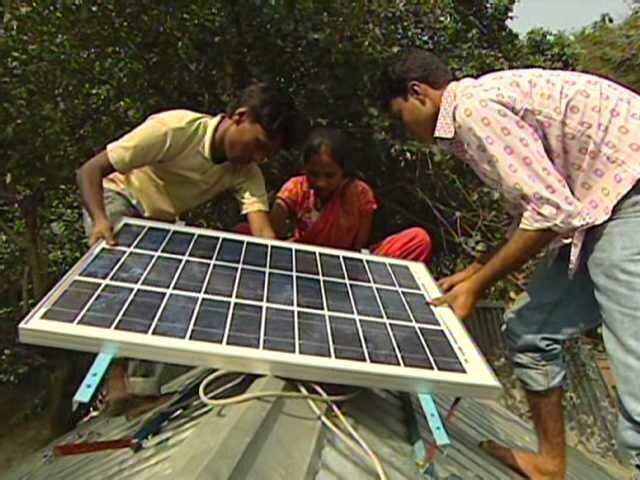 Bangladesh set a target of providing 1 million rural consumers with solar home systems by 2012 as part of a larger goal of 100% electricity access country-wide by 2021. 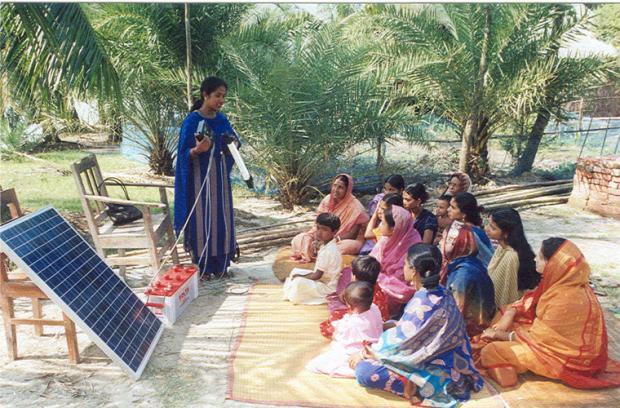 To help accomplish these ambitious goals, IDA committed to strengthening the managerial capacity of the Rural Electrification Board, and in August 2009, IDA approved additional financing of about US$ 130 million to expand Bangaladesh's rural renewable electricity project. In June 2014, the government of Bangladesh signed on for $78.4 million of additional financing from IDA to further expand the SHS program to 480,000 additional homes. At the time, SHS was reported to be installing at least 50,000-60,000 solar home systems per month. By the end of 2014, about 3.5 million households - representing 10% of the nation's total and approximately 15 million people - had solar home systems installed. In addition to the solar home systems, the project also is reported to have supported more than 1450 biogas plants, 40 solar irrigation pumps, and improved cook stoves. The project aims to bring improved cook stoves, which particularly benefit women and children by offering a cleaner, healthier, safer solution than traditional wood burning, to 1 million rural households.